Attention bakers, dessert lovers, diabetics, & dieters: You need this recipe. It delivers so much, it’s almost too good to be true! 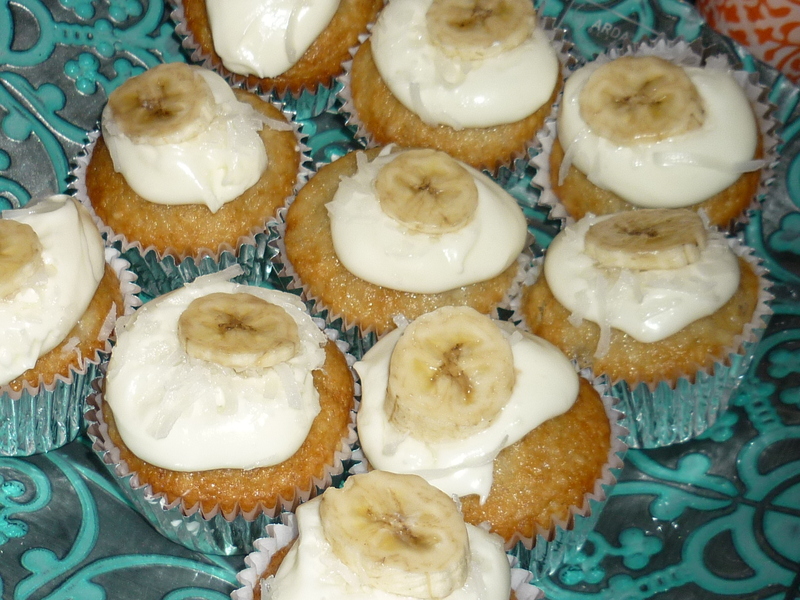 It’s so moist and full of banana flavor and that’s not all. It has a surprise of coconut flavor in it and – it’s lower in fat. It has so much to offer! Often times I am asked to bake diabetic desserts and I am skeptical that I will find something so delicious and satisfying. I am thrilled that this cupcake delivers all that. You can make this with or without an electric mixer with the same results – a moist flavorful cupcake. Just don’t overmix when combining the wet and dry ingredients (that’s key to the moistness!). You’ll notice in the pictures I’ve decorated it 2 ways. The sliced bananas looked pretty initially, but they turned brown so fast and I didn’t have a chance to sprinkle any lemon juice on them (I was in a hurry!). I also sprinkled sweetened shredded coconut on top. 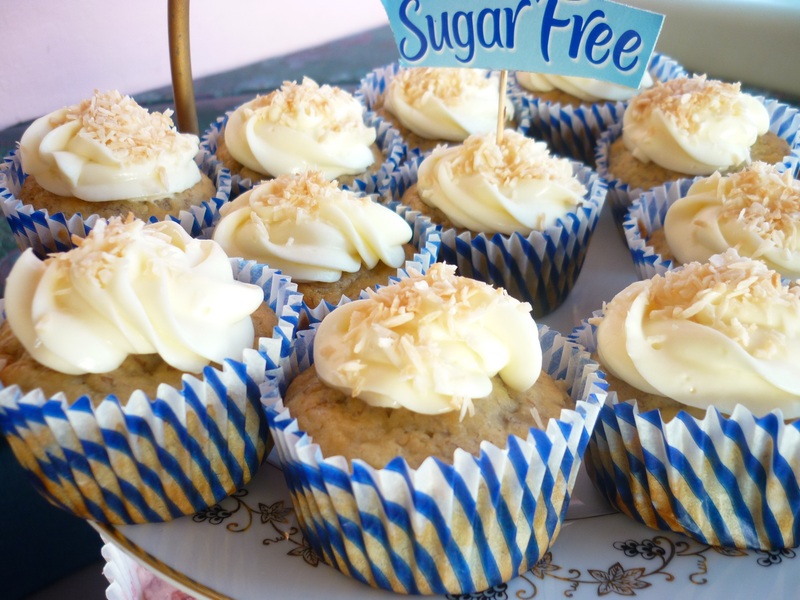 I wouldn’t advise this because the sugar in the coconut melts and you get a gritty feeling in your mouth. 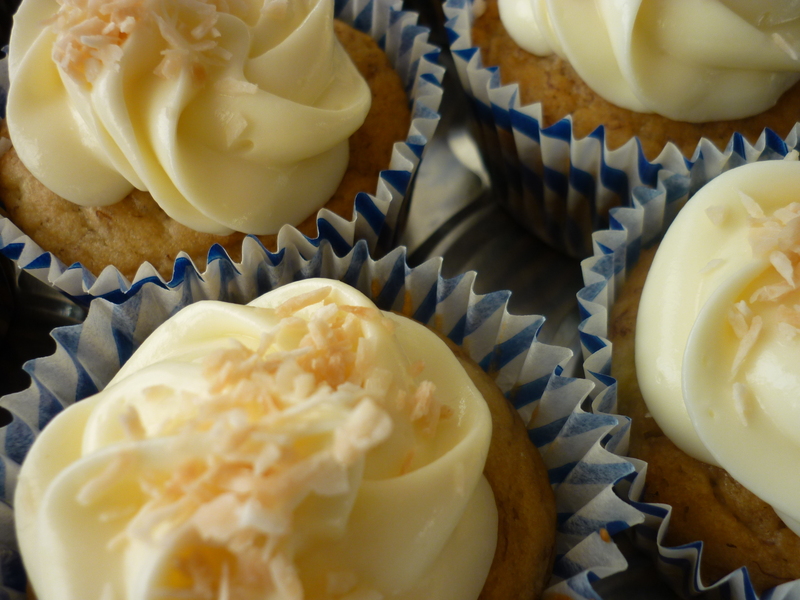 In the photo below, I had time to pipe my frosting, and I decorated it with some toasted fresh coconut. The toasted coconut added a depth of flavor. I have a few more diabetic recipes to share with you in the future. I can assure you, only the ones that taste great will be on my blog. Honest!